We booked an extra long weekend to travel to Montreal for David’s birthday. For 5 days we splurged in the Ritz-Carlton Montreal. It was a weekend filled with treats. But we could not leave before we enjoyed afternoon tea at the first Ritz-Carlton in Montreal. During our travels in 2018, we enjoyed many luxury stays. And some of the most enjoyable were in Ritz-Carlton branded hotels. Imagine our surprise when we learned that the Ritz-Carlton Montreal was the first hotel to bear the Ritz-Carlton name. 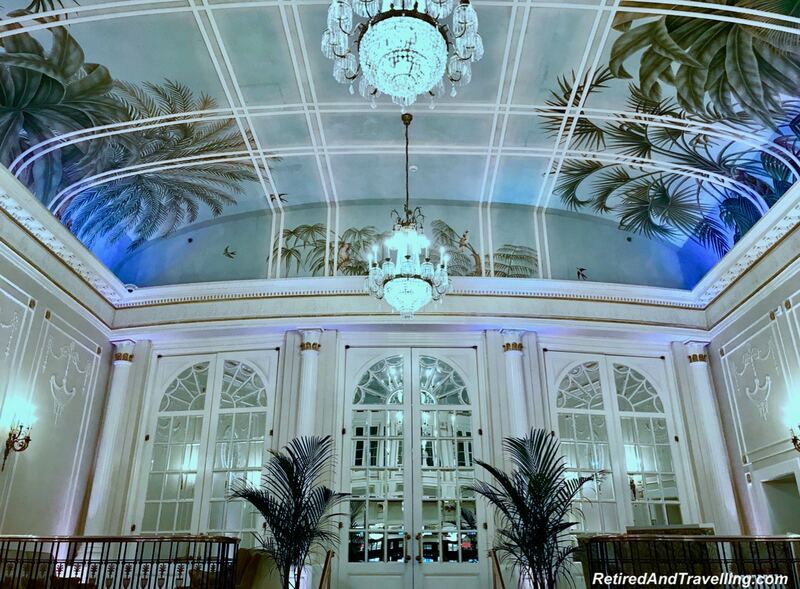 In 1912 when the hotel was being built, it was initially planned to be modelled after the Carlton in London. But one of the investors, Charles Hosmer, was a personal friend of César Ritz. And he decided that he wanted to add on the panache of the Hotel Ritz Paris. At the time it cost $25,000 to purchase the right to use the Ritz brand in the name. But the right to use the name came with gold standard conditions too. We saw these gold standards still being kept alive today. And it bears the CAA/AAA Five Diamond award. 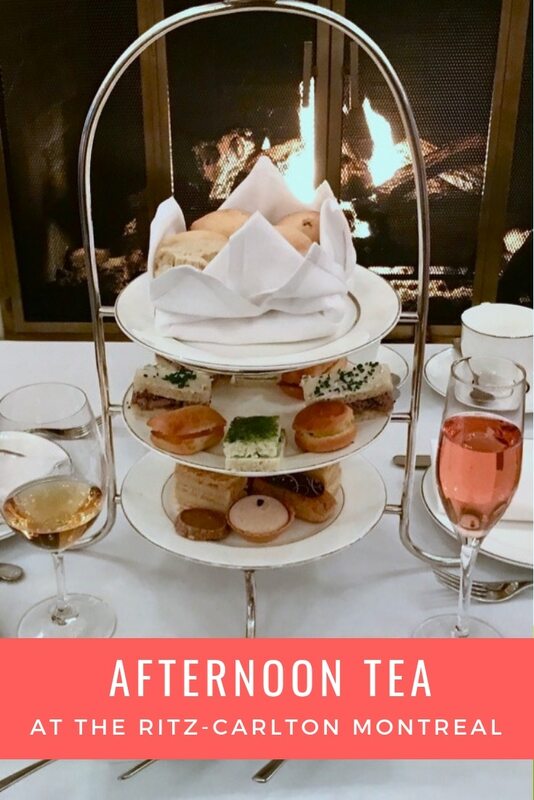 Afternoon tea at the first Ritz-Carlton in Montreal was a lovely way to enjoy the ambiance, service and taste that the Ritz-Carlton brand brings. 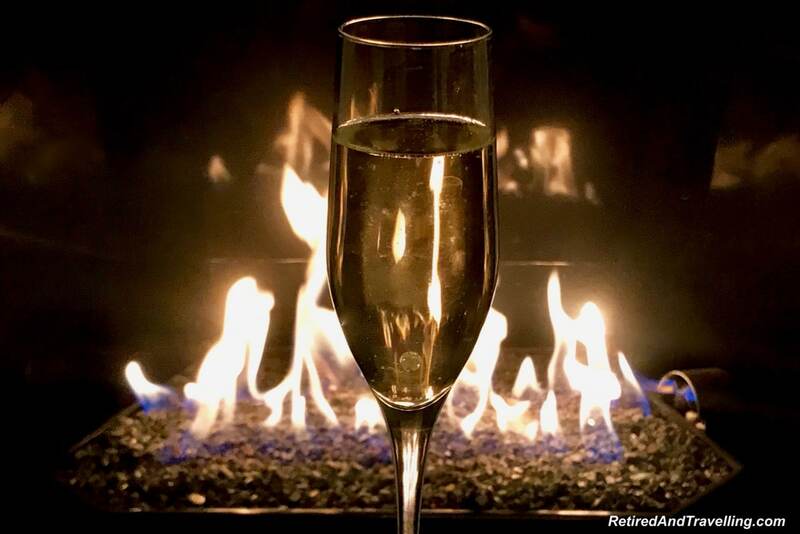 At every point during our luxury weekend at the Ritz-Carlton Montreal we observed the absolute dedication to the Ritz-Carlton gold standard. The experience started before we even left home. A phone call from Valerie made sure that every need and desire for our stay was known in advance. Even though she was off for the weekend, every detail was recorded and delivered. When the cab pulled up at the hotel, Andre greeted us by name. It certainly freaked out our cab driver. I am sure he wondered just who we were. At every point as we moved through the hotel over the 5 days at the Ritz-Carlton Montreal, we were address by name. Veronica (the Guest Relations Director) met us at the front desk and offered a tour of the lovely hotel property. We learned much about the history of this great hotel. And about the gold standards this hotel takes to heart. 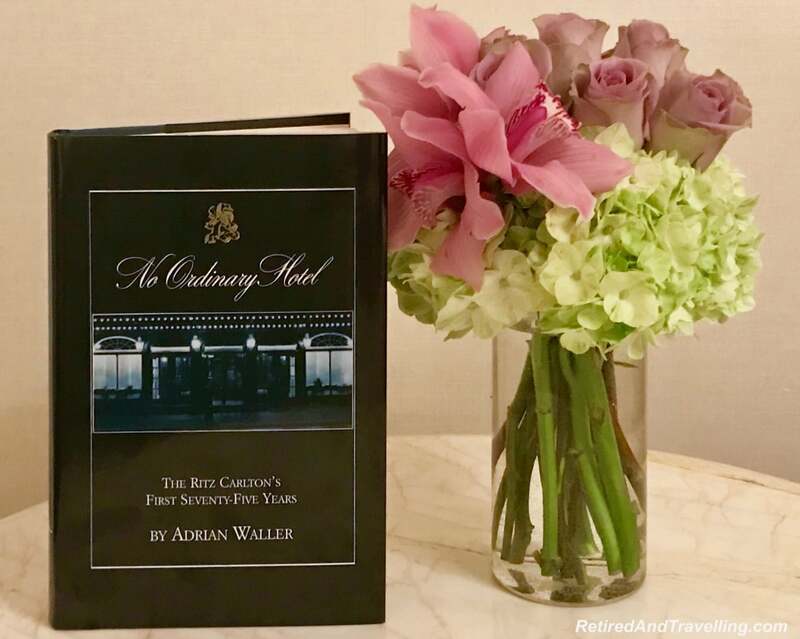 When Andre saw that we were interested in the history of the hotel, he delivered a book about the hotel to our room. The Ritz-Carlton motto reads … “We are Ladies and Gentlemen serving Ladies and Gentlemen.” The credo emphasizes that the “genuine care and comfort of our guests is our highest mission” in a way that “fulfills even the unexpressed wishes and needs of our guests”. When a hotel delivers on this promise, you can be sure you will have the greatest experience. The Ritz-Carlton standards are high. But we certainly felt that the staff at every level in the Ritz-Carlton Montreal delivered on the gold standard promise. How could we not want to try afternoon tea at the first Ritz-Carlton in Montreal? 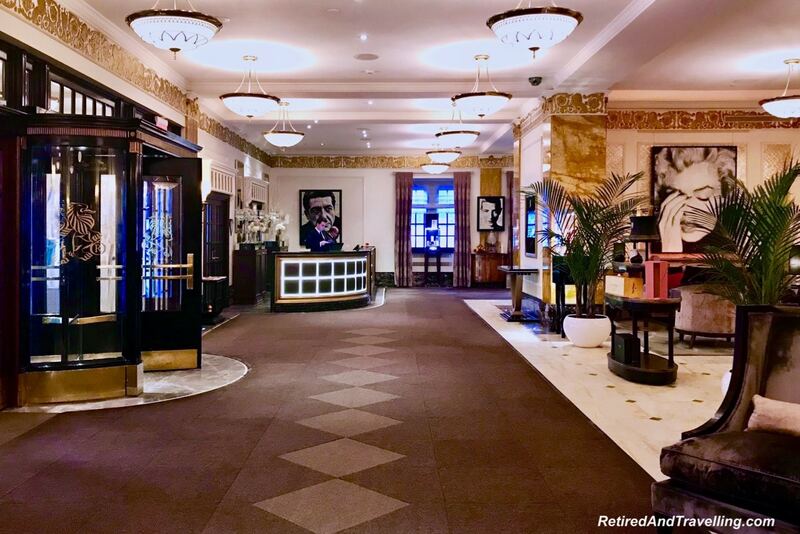 The Ritz-Carlton Montreal was closed to complete a $200 million transformation for its centennial anniversary. 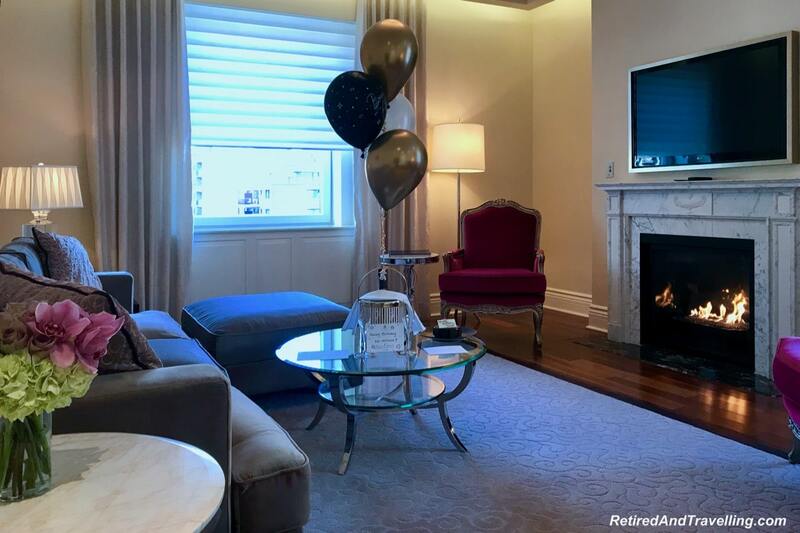 When we spoke with the General Manager Andrew Torriani, he talked about maintaining the atmosphere of the original building during the renovations. At the same time, they wanted to bring modernization and innovation to the hotel. We have seen this balance done successfully in other historic buildings. When we stayed at the palace pousada in the Algarve in Portugal, that balance worked well. 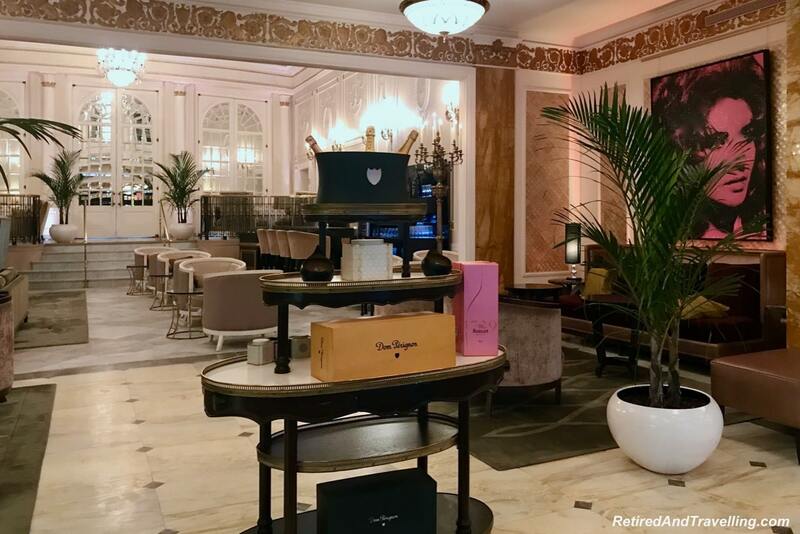 The public space design at the Ritz-Carlton Montreal maintains the key elements that César Ritz required to use the Ritz name. When you enter the hotel, you do not face the check-in counter. A lovely lounge area greeted us inside the front door. That the lounge was stocked with Dom Perignon did not go un-noticed. The check-in counter faces the elevators so that staff can interact with guests when they enter and exit the hotel. The grand staircase still stands off to one side of the lobby. This was designed so that ladies with their gowns could sweep down the stairs. 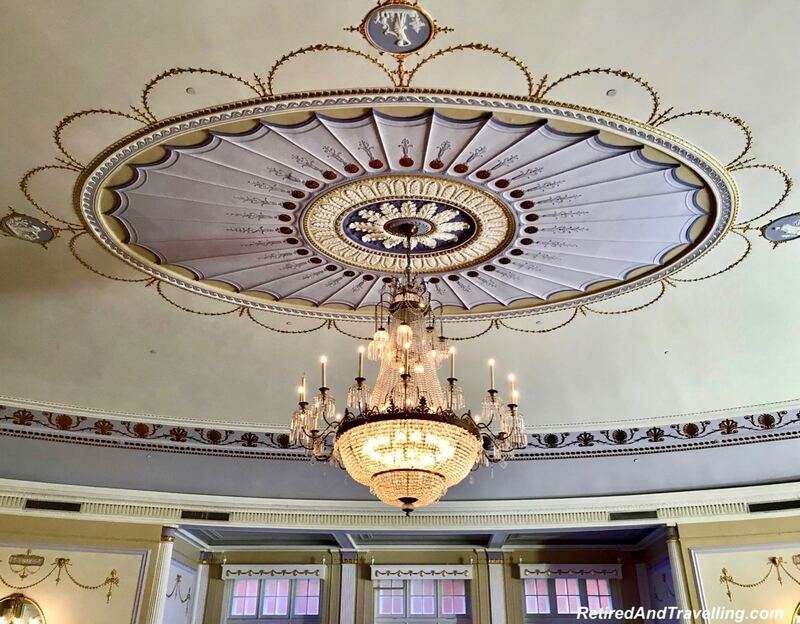 The Oval Room was restored but maintains the beautiful architectural designs. 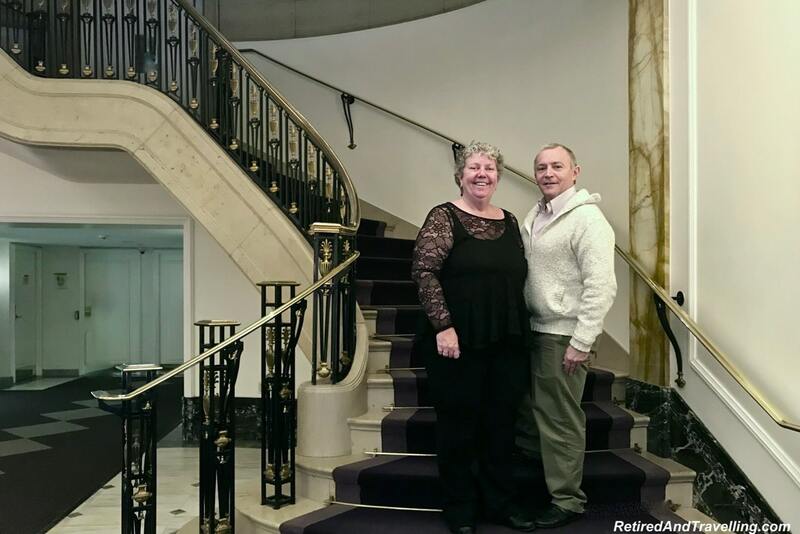 We enjoyed the lovely historic setting that is the Ritz-Carlton Montreal. The hotel rooms were a mix of traditional design elements with modern technology. 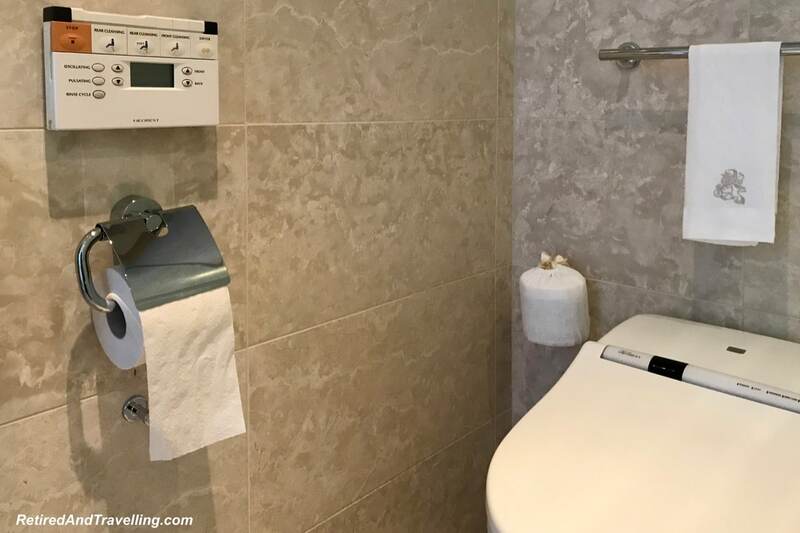 Our great suite had all of the technical delights we had come to love on our five star hotel experience in Asia. The living area had a large fireplace with electric controls. It was easy to turn it on when we wanted the heat or the mood. The windows had both sun shades and black out curtains. Both were operated with electric controls. Most lights were operated from central panels on dimmer sliders. A night light was automatically triggered when your feet hit the floor and the lights were out. The Ritz-Carlton Montreal even brought another Asian delight to the hotel. The bathroom floor was heated and the toilet had a heated seat. This was the worst cold surprise we had when we returned home! It was amazing how quickly we got used to this treat. The toilet itself was a Japanese bidet toilet with multiple settings and heated water. It was a good thing we became masters at using this on our 8 weeks in Asia. 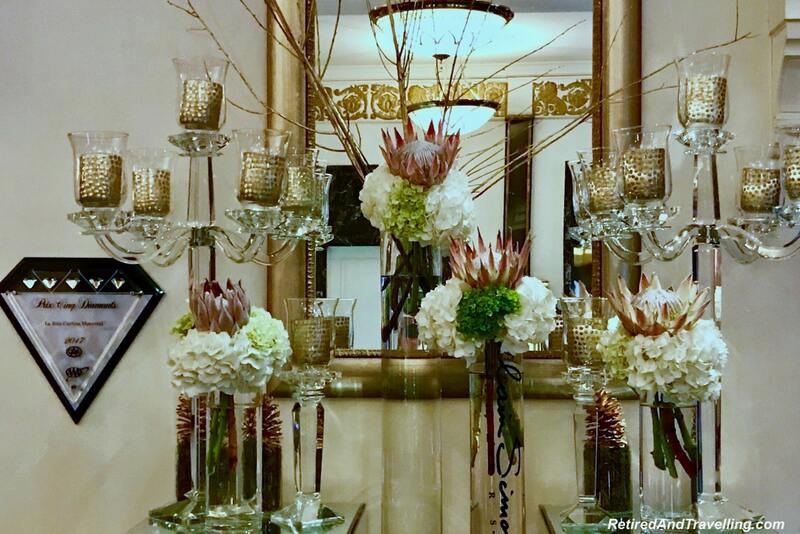 We loved the traditional design elements in our great suite. But the modern technology certainly was a great delight. We do love to splurge on afternoon tea when we travel. 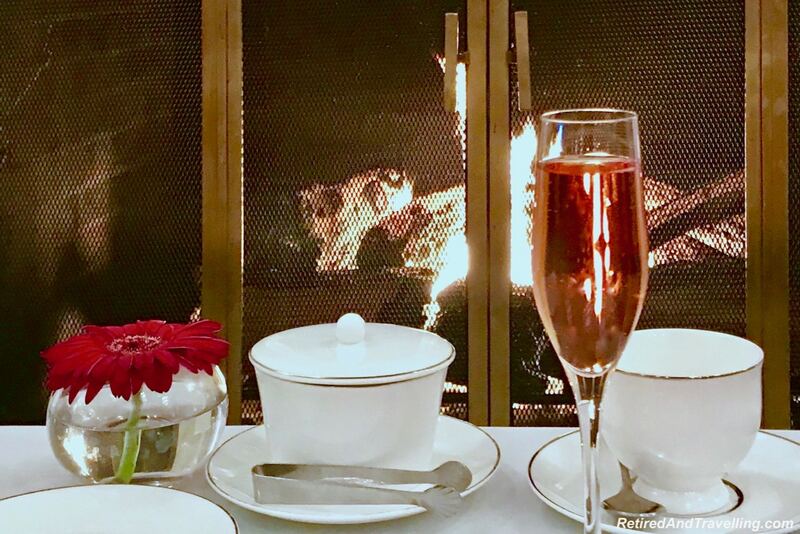 When it was cold in Toronto, a tour of the Toronto afternoon tea settings warmed us up. We even had tea at the castle in Toronto. 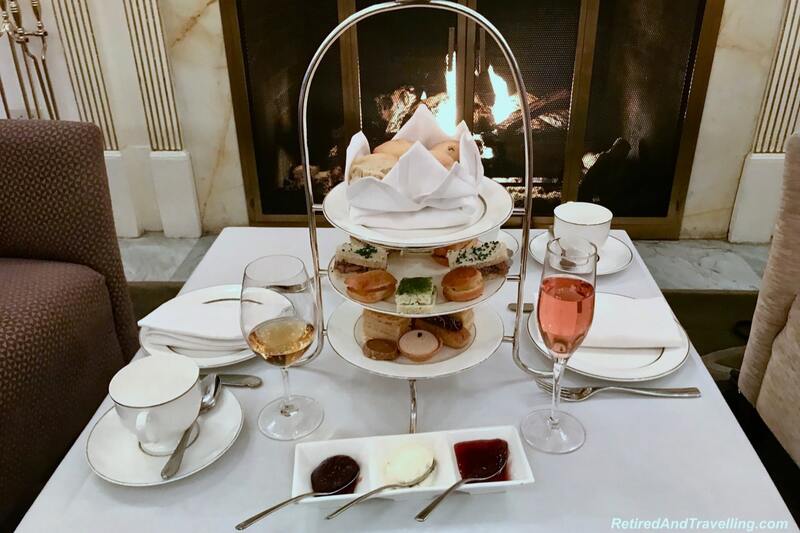 When we visited Washington DC for cherry blossom season, we could not pass on the spectacle that is afternoon tea at the St Regis. It was the first time we saw champagne bottles sabred open! 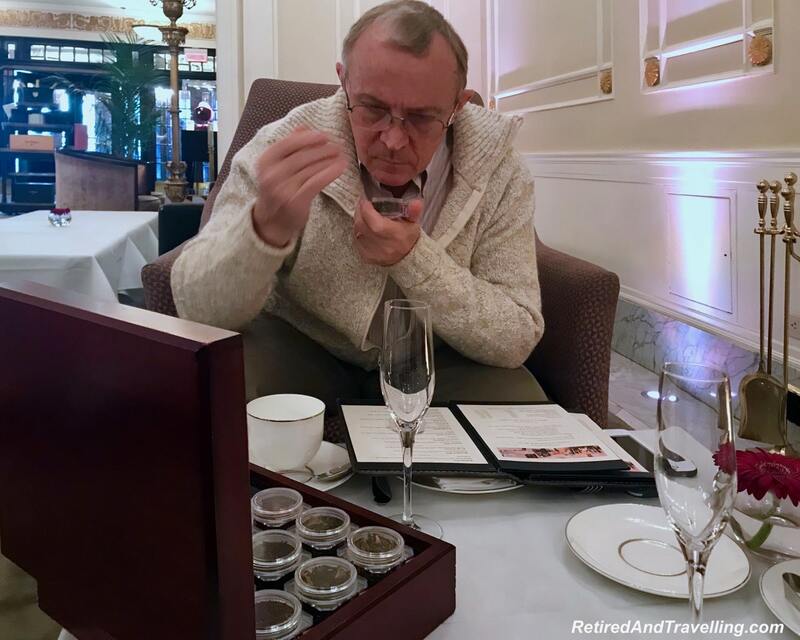 So on our luxury getaway weekend, we could not miss afternoon tea at the first Ritz-Carlton in Montreal. Afternoon tea was served in the lovely Palm Court. The ceiling design and chandeliers kept us looking up. 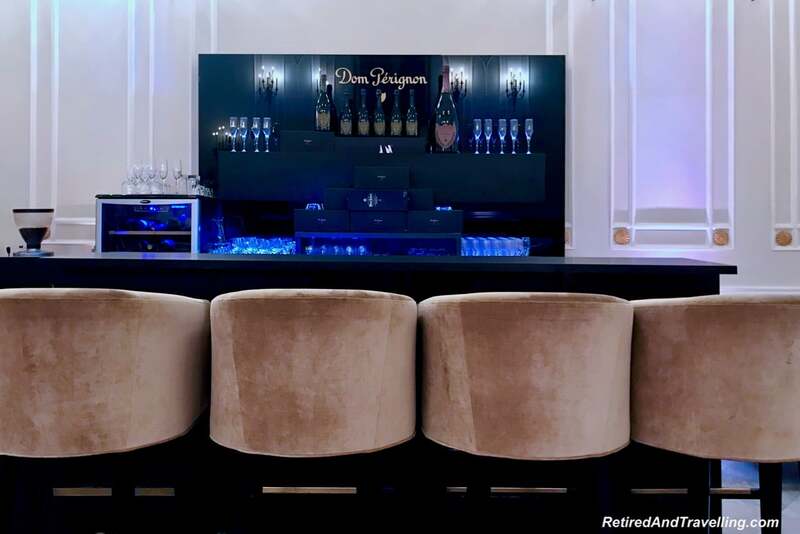 One wall of the room holds the Dom Perignon Bar. Several different seating areas were set up with space between them. Even though demand was high for tables at afternoon tea, they have resisted the temptation to cram in more tables. A table was reserved for us in front of the fireplace. 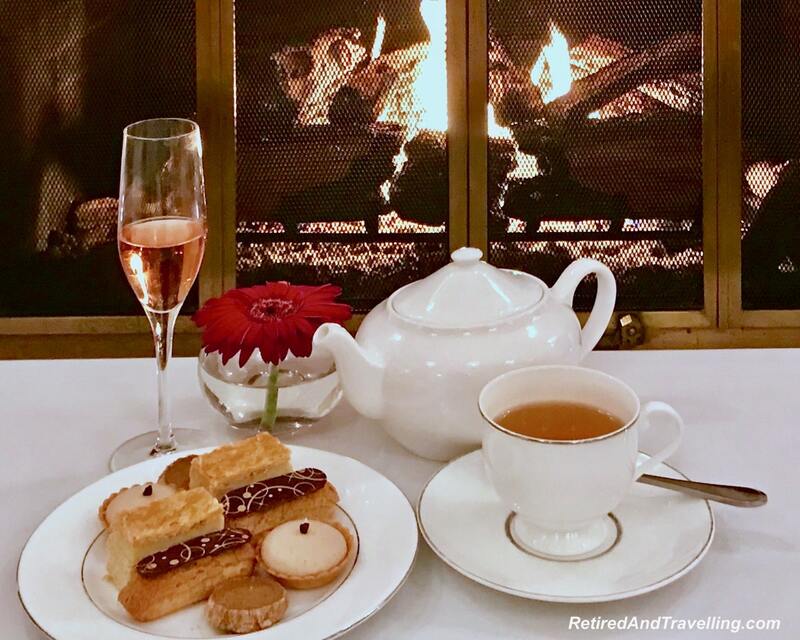 It was a lovely and romantic spot to enjoy our afternoon tea at the first Ritz-Carlton in Montreal. We love when an afternoon tea actually includes a good selection of teas. We looked at the list and had the sniffing box brought over. Of course, we selected two very different teas. When the tea pot was brought to the table, we also received a tea timer. The tea was brewed for the exact right amount of time. The tea tray had 3 tiers of tasty treats. We started with a selection of savoury items. They even swapped out the egg salad for David! 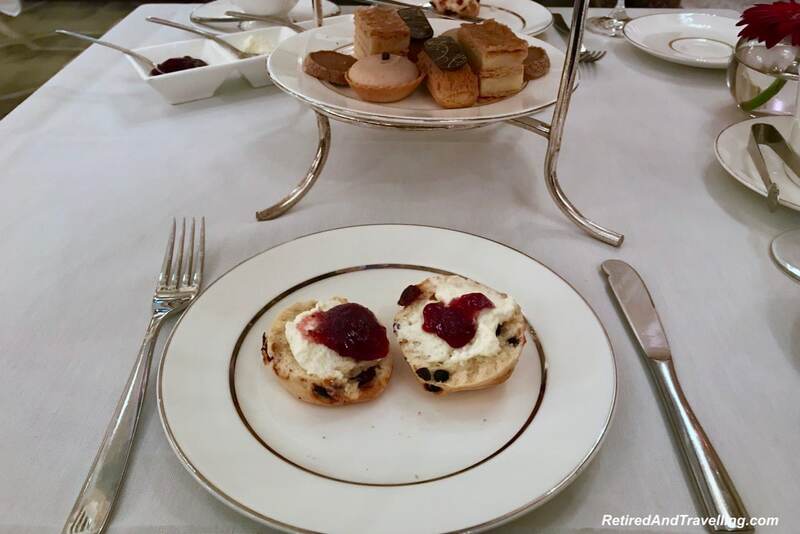 Two different versions of scones were served with clotted cream and fresh preserves. The cranberry scones were my favourite. The last tier was the sweet selection. Local in-season specialities tempted us. And yes, we did eat 3 layers. 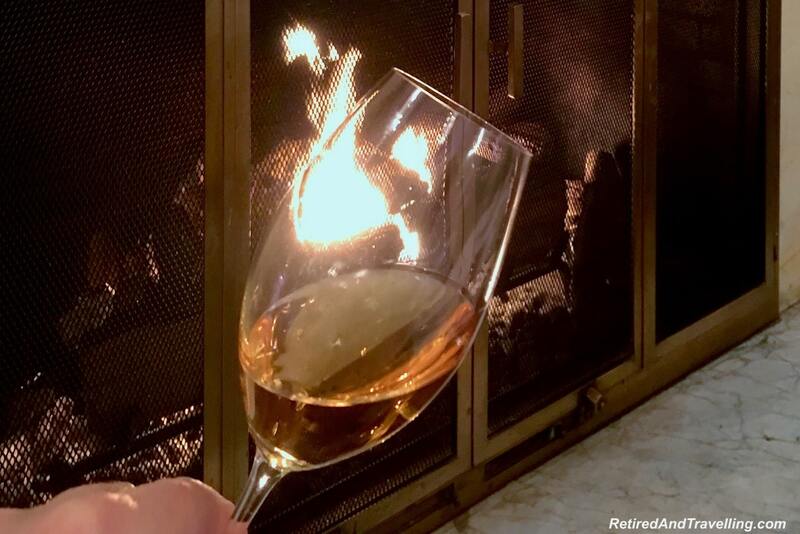 While we had our tea, we could not pass on the chance to toast with something bubbly too. 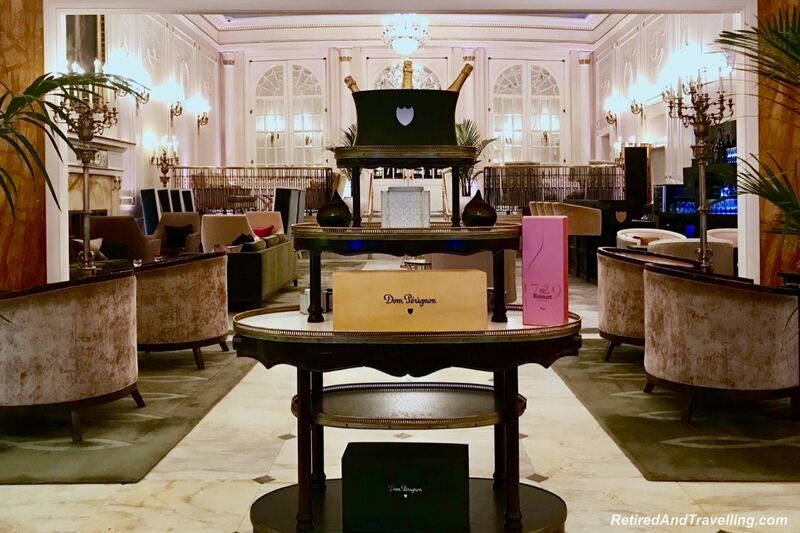 Since we were by the Dom Perignon Bar, the champagne list was long and varied. David had been introduced to a great sweet local Quebec ice wine and that was his drink of choice. 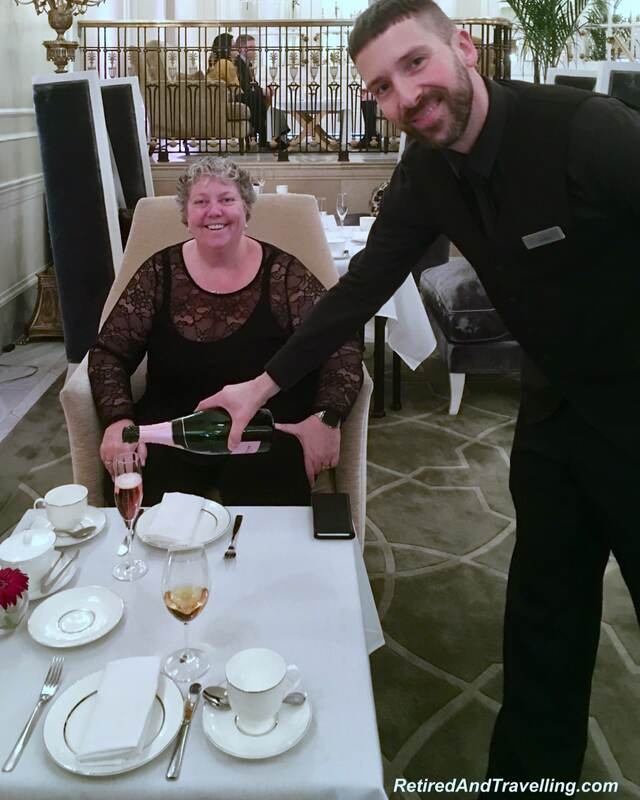 We finished our meal with a toast to afternoon tea at the first Ritz-Carlton in Montreal. We splurged for a 5 day long weekend at the Ritz-Carlton Montreal. There was so many great indulgences as we enjoyed the facilities and the hospitality. And ate and drank at every opportunity. But afternoon tea at the first Ritz-Carlton in Montreal was the perfect way to cap our world class experience. It was great to enjoy this treat in the first Ritz-Carlton ever. 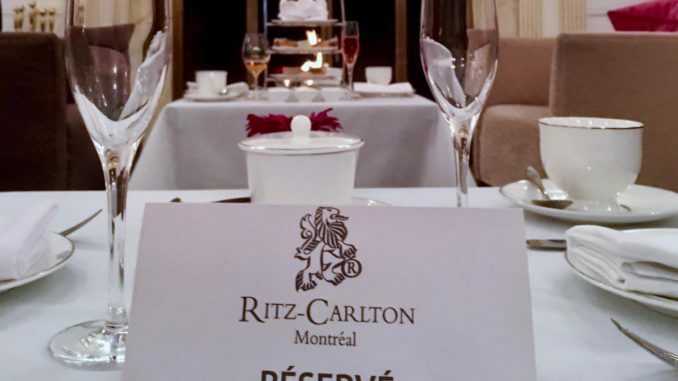 And it was wonderful to see that the gold standards prescribed when the Ritz name was used are being honoured in every way at the Ritz-Carlton Montreal. 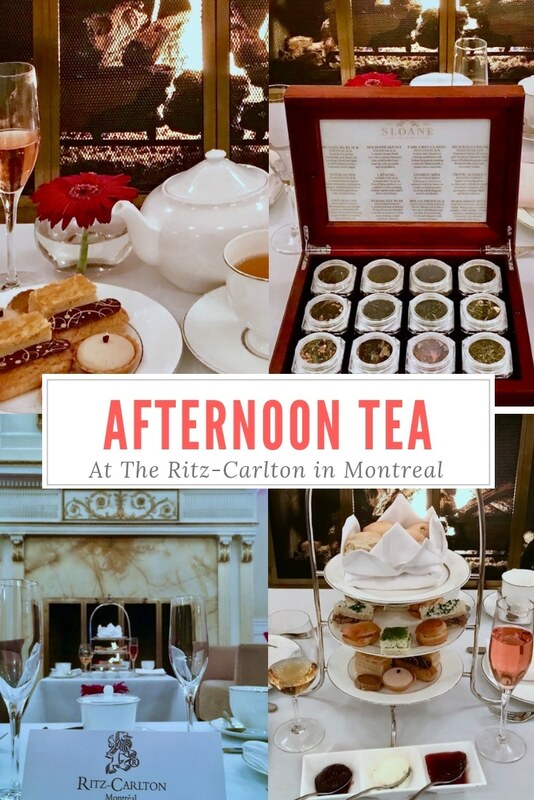 Have you done afternoon tea at the first Ritz-Carlton in Montreal? Do you have another suggestion for a great afternoon tea around the world? Notice: Our afternoon tea at the first Ritz-Carlton in Montreal was paid for entirely by us. Certainly during our stay at the Ritz-Carlton Montreal, we received special perks based on our Marriott Rewards Platinum Premier Elite status and treats to celebrate David’s birthday. It would be silly to say that the wonderful treatment we received at the Ritz-Carlton Montreal did not influence our opinions. But that experience is part of the Gold Standard the Ritz delivers. And the comments and opinions expressed in this post truly represent the delight we felt during the entire weekend. Wow, what an impressive experience and setting – I love this type of indulgence with all the delicious foods, presentation and ambience. This looks like a spectacular tea experience. Oh I am so reminded by our Afternoon Tea at the Ritz-Carlton in London! Didn’t know the one in Montreal is the first one! Sounds like you had a great stay there! I love that they kept the atmosphere of the original building. On a side note, I only started adding milk into my tea a few months ago and it was a total game changer! Wow that seems royal! I like it when hotel staff gives such personal touch when hosting. Excellent ambiance and food. It will be hard to walk out from this. Good to see heritage being maintained. Luxurious yes that’s what I can say. It looks like you had a wonderful weekend – and a great tea! My favourite tea so far has been at the Pendray House in Victoria, BC. Try it out if you’re there. The hotel looks gorgeous. 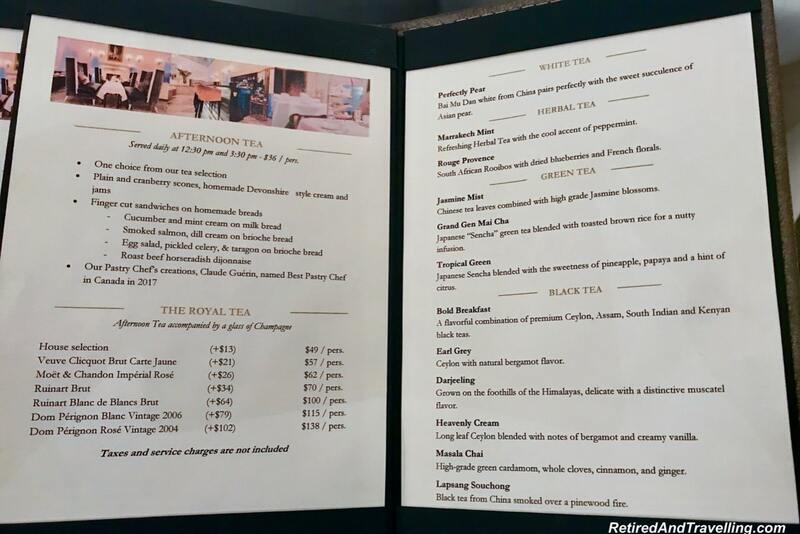 I wouldn’t have thought that afternoon tea was a big thing in Canada, but then it’s also popular in Asia. I guess it’s the British influence from the past that has left us with this wonderful experience. The Ritz-Carlton Montreal still looks so grand in spite of being first! The ambiance and the royal touch is so perfect. Personal touch by the staff is always welcome and very heart warming. Would like to go there at least once. So great. I had no idea that was the first RC! Looks like you guys had an amazing 5 days there. And it sounds like we need to add that Ritz to the list! Those afternoon tea sweets look divine. I’ll take a glass of champagne and some black out curtains any day. Hehe. This looks like pure luxury. 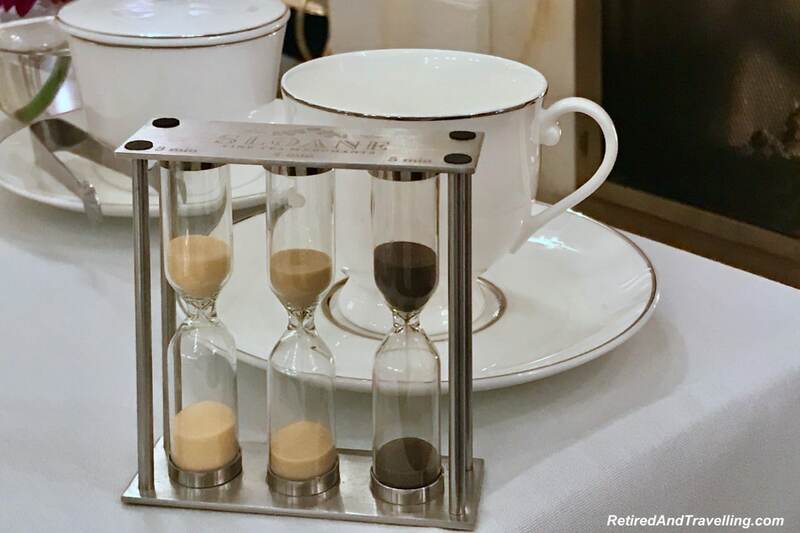 This is such a great indulgence and I am so hooked with the setting as well, my very first time to see a tea timer as well. I won’t mind splurging like this giving a good treat as well. Ooh, this experience looks absolutely divine! It’s good that the Ritz has such high standards. I suppose that’s how they keep their exclusivity and luxury.